A Punnett square is a tool used by geneticists to determine the probability of traits in offspring from a mating of two individuals. 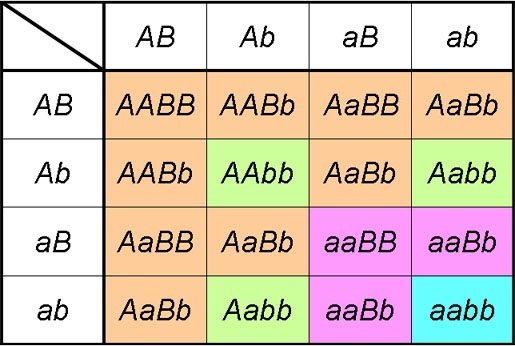 The letters within the Punnett square indicate alleles of certain genes. The simplest Punnett square analyzes the outcomes of only a single gene, but more complex Punnett Squares can add any number of genes. For example, a dihybrid cross can predict the outcome of two different genes with various alleles present for each gene. More complex Punnett square operations can be completed by computers, making complex analyses more manageable. The most basic Punnett square is started by drawing square, and dividing it into 4 equal parts. 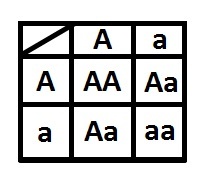 The letters that go on the top and side of the Punnett square are the alleles contributed by each parent. Each allele gets a column or row. Now, to fill in the Punnett square, simply transfer each letter to the column or row it starts. When this is finished, you will have a Punnett square like the one below. Each box within the Punnett square represents one possible genetic outcome for the offspring. 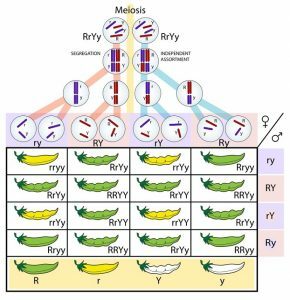 In a diploid organisms, each organism can only carry 2 alleles. There may be many more alleles present in the population at large, but between the two individuals mating, there can only be 4 different alleles total. Most simple Punnett square diagrams only consider 2 alleles. The alleles are capitalized based on their relationship to other alleles. If the allele is dominant, and will mask the effects of other alleles, it is capitalized. Alleles which need two copies of themselves to produce a phenotype are considered recessive, and are given lower-case letters. Other relationships between alleles are indicated with superscripts, subscripts, and other designations to separate alleles with incomplete dominance or codominance. A Punnett square is a graphical representation of the process of meiosis, which creates gametes in sexually reproducing organisms. During this process, the diploid genome is divided and reorganized into 4 unique haploid cells. Each of these cells carries only one allele for each gene, which relates to the single homologous chromosome it received during the process. The above image shows how the process of meiosis leads to the same outcome as a Punnett square. The process of meiosis includes two main caveats which ensure the alleles are separated. The law of segregation ensures that each gamete receives only 1 allele for each gene, by separating the homologous chromosomes. The law of independent assortment can be seen on the right, with maternal and paternal chromosomes being mixed. This ensures that genes are distributed randomly to gametes, which can rearrange the original parental genotypes. After the process of meiosis, each parent has a number possible gametes to contribute to the process, but there are only two possibilities per gene. Any combination of two gametes is possible during the mating. 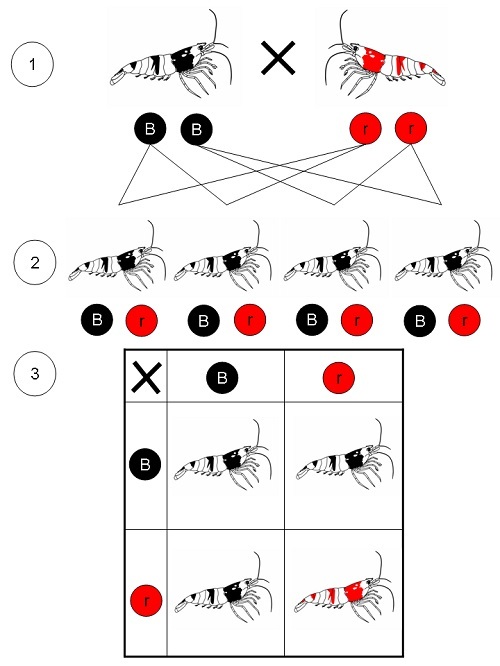 In species that only have a single offspring per mating, any one of these boxes could match the offspring. Scientists can predict the phenotype by counting and comparing similar phenotypes in the Punnett square. With larger groups of offspring, they will typically demonstrate the same ratio of phenotypes as seen in the Punnett square. Below is an example of a simple Punnett square, created to estimate the probabilities of and F1 hybrid cross. Number one in the example shows the parental generation. These shrimp carried homozygous alleles for the gene determining color. One shrimp had two recessive alleles, which creates a red shrimp. The other shrimp is black, and carries two dominant alleles for the gene. The F1 generation, seen next to number 2, is all black. That is because they each received one black dominant allele and one red recessive allele. This means their phenotype will be black. Scientists want to know the ratio of red to black offspring in the next generation, so they create a Punnett square. Each individual in the F1 generation is heterozygous, carrying one of each allele. This information is transferred to the Punnett square, and the possible genotypes are extracted. This Punnett square shows the expected phenotypes of the offspring, which will have a 3:1 black-to-red ratio. The F2 generation will contain many more than 4 individuals, but they will likely show the same ration. A Punnett square can examine much more complicated relationships than a single gene. The Punnett square below shows the interactions between two genes on a single trait, a condition known as a polygenic trait. These genes influence the color of the theoretical organisms involved. If you look at the parental phenotypes, you will see that each parent now has 4 possible gamete combinations, instead of two. 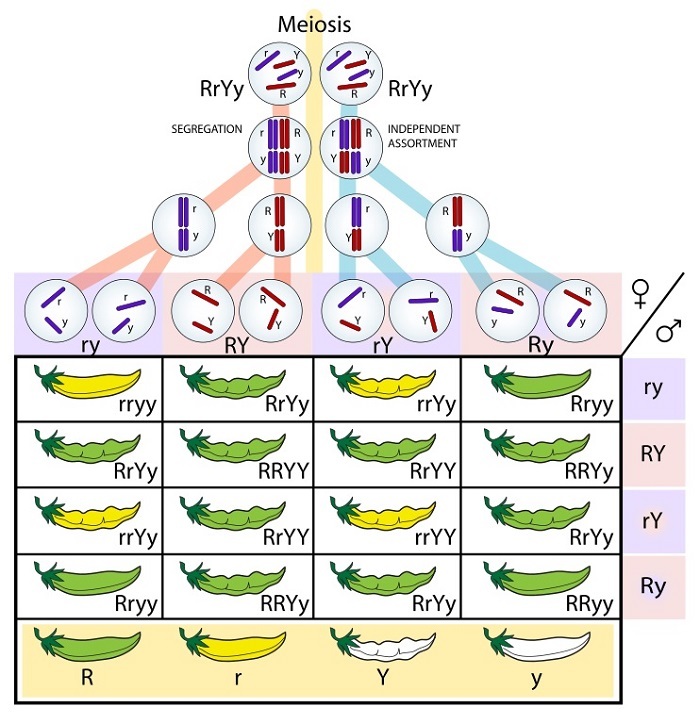 This is because of independent assortment, which can rearrange the chromosomes and thus provide any combination of alleles to the new cells formed by meiosis. In this Punnett square, you can determine the parental genotypes by analyzing all of the alleles they contributed to gametes. If you do this, you will find that each parent contributed both types of alleles for both genes, making them dihybrids (AaBb). In this dihybrid cross of a polygenic trait, the phenotypic ration is 9:3:3:1, resulting from the different combinations of recessive and dominant aspects of the trait. While this ratio is to be expected in the resulting population, this assumption is based on many conditions. Together, these conditions are called Hardy-Weinberg equilibrium, and include things like migration, small populations, and evolutionary pressures, all which could change the outcome of the next generation. In the complex Punnett square above, the results could not accurately predict the next generation if one of the colors is naturally selected. If all of the blue organisms get eaten right away, you will not see any in the next generation and those alleles may decrease in frequency over time. 1. What can you learn from a Punnett Square? 2. How many boxes (only offspring boxes) would be needed to analyze a trihybrid cross, containing 3 genes and 6 alleles? 3. Why would you want to analyze more than a couple genes at once? A. You wouldn’t. It would be way too complicated! Pough, F. H., Andrews, R. M., Cadle, J. E., Crump, M. L., Savitzky, A. H., & Wells, K. D. (2004). Herpetology. Upper Saddle River, NJ: Pearson Prentice Hall.